Enjoy a four course dinner and a complimentary glass of wine at one of New Orleans' oldest Creole establishments. 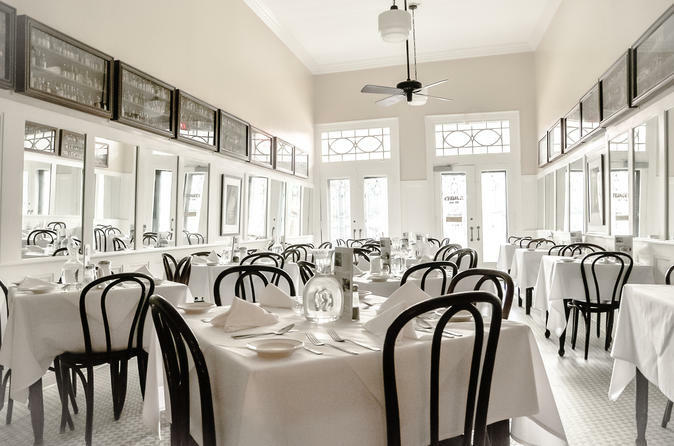 Located in the heart of the French Quarter, Tujague's Restaurant has been serving New Orleans' locals and visitors alike for 160 years. In addition to serving traditional New Orleans' cuisine, Tujague's is famous for its boiled beef brisket, a house specialty served with creole horseradish sauce since 1856. Make a reservation to immerse yourself in history tonight! Dinner reservations at Tujague's are recommended and are available from 5:00 to 9:00 pm Sunday through Thursday and from 5:00pm to 10:00pm on Friday and Saturday. Once your purchase is confirmed, please call the restaurant to secure a time. Please contact restaurant for additional inquiries regarding the menu.